Windows administrators can accomplish many of their routine tasks much more quickly by using the command line (similar to the command line of DOS or Unix-based systems) than by going through the graphical user interface that most users associate with Windows.Windows 20000 Commands Pocket Reference documents the Windows command mode. It's designed for system administrators, but will also be valuable to many users. It includes most available Windows 2000 commands, as well as the most useful system administration command-line utilities from the Resource Kit. Weeded out of this book are Windows commands and command options that are obscure, obsolete, broken, unacceptably insecure, or frankly inadvisable, as well a few special-purpose classes of commands. Whenever several utilities perform essentially identical tasks, we include only the best of them.Commands are grouped according to their purpose and function; within a group, commands are arranged alphabetically. 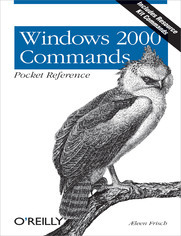 Options for each command are grouped by function and ordered by importance.The Windows 2000 Commands Pocket Reference complements Windows 2000 Administration in a Nutshell by conveying the kind of no-nonsense, boiled-down information typical of O'Reilly's highly successful companion Pocket Reference series. It's a valuable, concise reference to Windows 2000 commands and command-line utilities.